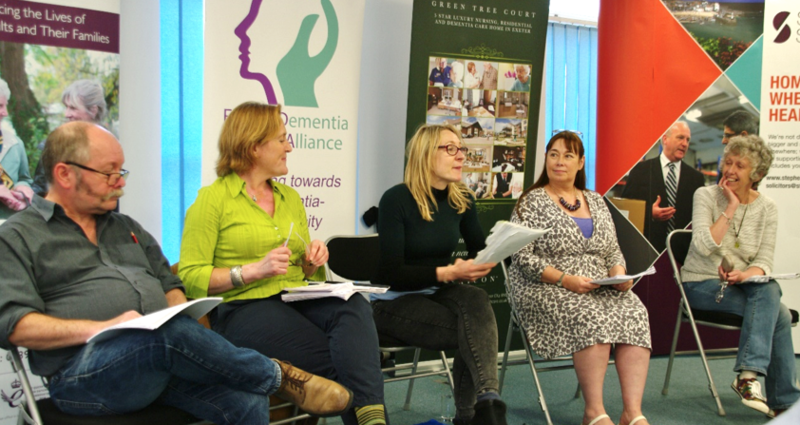 The Exeter Dementia Action Alliance (EDAA) organised their second annual members event kindly hosted by Stephens Scown LLP. The afternoon consisted of the moving play reading ‘Don’t Leave Me Now’ by playwright Brian Daniels. Home Instead Senior Care Director, Mark McGlade, one of the play sponsors, said “We were thrilled to sponsor the play reading and support the work of the EDAA. The play delivered a wonderful and sympathetic insight into the lives of those living with dementia and the impact on loved ones. The event was a great opportunity to share experiences and best practices throughout the Exeter area”. Helen Rushton, Home Director of Green Tree Court, co-play sponsor explained “We attended with one of our residents Barbara Bearne who resides at Green Tree Court along with her husband Noel who lives with dementia. Barbara cared for Noel for many years prior to coming to us so found the whole afternoon enjoyable, informative and rewarding. She now looks forward to attending many more events and meetings”. Emily Winslow, Service Development Manager for Stonehaven Care Group and supporting alliance member, attended for the second year and said “Like last year it was emotional yet thoroughly uplifting”. John Harvey said “Hearing the lived experience of dementia at EDAA’s event this afternoon was so incredibly moving. Well done to Gina for pulling the event together so seamlessly”. Chris, living with Mixed Dementia, diagnosed at 50, and his wife Jayne Goodrick from North Wales shared their experiences with the audience. Jayne said “The work you are doing in the community is fantastic, without people like you people like us would be shouting from the sidelines. The message really hit home, a well organised and relaxed afternoon, thank you”. Jo Earlam, whose father lived with dementia and whose husband has more recently been diagnosed said “ I found the whole event very moving and cried through most of the play reading because it was such a true reflection of what it’s like for those living with it, and those living with them. The personal testimony from Jayne & Chris was heartbreaking and uplifting in equal measure”. Tony Husband, Award winning Cartoonist, was only too pleased to be involved in the alliance event for the second year by creating a diary of illustrations of the afternoon and personalised cartoons for some of the attendees. Mark Richardson of Stephens Scown LLP, who hosted the event for the second year, addressed the audience by explaining the importance of the ongoing need to be working towards dementia friendly communities and followed by congratulating Gina Awad, Alliance Lead, on her recent recognition in the Queen’s Birthday Honours. Gina said “we were delighted to be able to welcome the Deputy Lord Mayor to our second annual event who was touched and inspired by the afternoon. We value our alliance members and their support and this is another medium we chose to raise local awareness and educate our members . Thank you to Stephens Scown for supporting us again this year and to our speakers who travelled from across the country to be with us”.